Marianne von Lingenfels knew that the work that her husband and friends were doing was dangerous. While she may not have known all the details, she knew that they were planning to take down Hitler. When they failed, her safe life of wealth and glamour is over. But she is determined to make the best of things after the war. She returns to the family home and begins a quest to find the wives and families of the other conspirators. Marianne rescues Benita from the Russian army and finds her son and then brings Ania and her children from a refugee camp to join their home. She feels certain that she knows the right things to do now and that their shared history will bring the women together. But none of them are being entirely truthful about their experiences during the war and their secrets threaten to destroy the new family they have cautiously forged. I read a lot of novels set during the era of WWII and I'm always grateful when an author introduces me to something new. In The Women of the Castle, Jessica Shattuck focuses on the plight of women during and after the war. We witness the impossible choices that civilians must make in the heart of battle and the ways that those choices continued to haunt them even when the war was over. It's easy to believe that things got easier when the war ended but, in many ways, things continued to be difficult for a long time. Things do not magically go back to the way they were before the war and Shattuck shows just how difficult it can be to trust people again when your entire world has been upended. 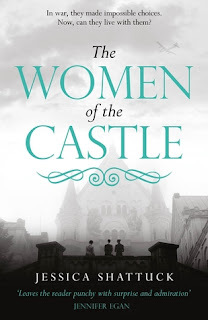 Note: My galley is called The Women of the Castle, but I see that most editions are The Women in the Castle. I don't know who changed the article or when, but they are the same book as far as I can tell! Kristoff is an orphan who finally finds a semblance of family in the home of Frederick Faber, a famous Jewish stamp-maker. When his mentor disappears, Kristoff must work alongside Frederick's daughter Elena to engrave stamps for the Nazis while cautiously forging papers to get people out of Europe. Fifty years later, Katie is going through a divorce at the same time her father is slipping deeper into Alzheimer's disease. When she decides to get her father's stamp collection appraised, she discovers a unique Austrian stamp on an unopened letter. She is drawn into the mystery of where the stamp came from, who made it, and what connection it has to her beloved father. Dual narratives can be the worst, right? 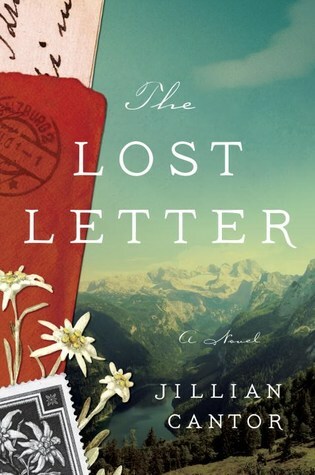 Thankfully, Jillian Cantor achieves some sort of literary wizardry in The Lost Letter by writing well-rounded characters in the past and a protagonist that won't drive you crazy in the present. The ending is slightly predictable, but sometimes it's just nice to read about people (even fictional ones) who survived WWII and got a happy ending. I really enjoyed reading this book as well as Cantor's take on the Rosenburgs in The Hours Count and I'm glad I still have one more book of hers to read. It's like you've got a little theme reading going on! :) These books sound good. Do you have a favorite between the two? It was a happy accident as I looked at the list of books I still needed to review! I think I enjoyed The Lost Letter a bit more; Jillian Cantor is a really lovely writer. I love the sound of your first book. I do so like WW settings. Each individual story told from another angle and another angle. Fascinating. Me too! I will always pick up and at least consider reading another WWII novel.